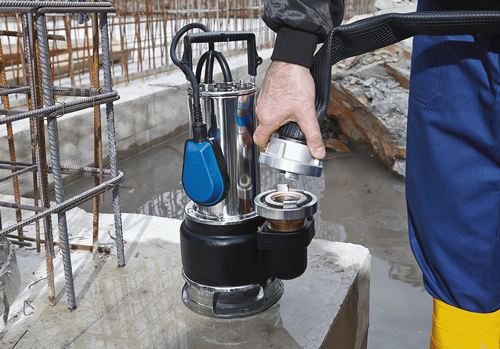 The OASE ProMax Drainage Pumps are ideal for emergency extraction of nuisance water. OASE ProMax Garden Irrigation Pumps and Well Pumps. Water Garden UK offer a range of high quality OASE Drainage and Irrigation Pumps to suit a variety of pumping tasks. The OASE ProMax series are engineered in Germany and offer superb performance and reliability. The ProMax MudDrain Drainage Pumps can tackle large solid waste particles up to 40mm diameter (MudDrain models 20000 & 25000) so are ideal for evacuation of ponds, lakes and construction site use. The ProMax ClearDrain pumps are capable of puddle sucking down to 1mm water depth so are well suited to draining cellars and wet work areas.